The first conference of the Service Design Network in Amsterdam is just ended. I found it very interesting, not just for the presentations, which, after all, were not memorable. But rather for the quantity and quality of contacts I had in this conference. My general impression is that there is only one place where someone is really doing something on service design, UK. 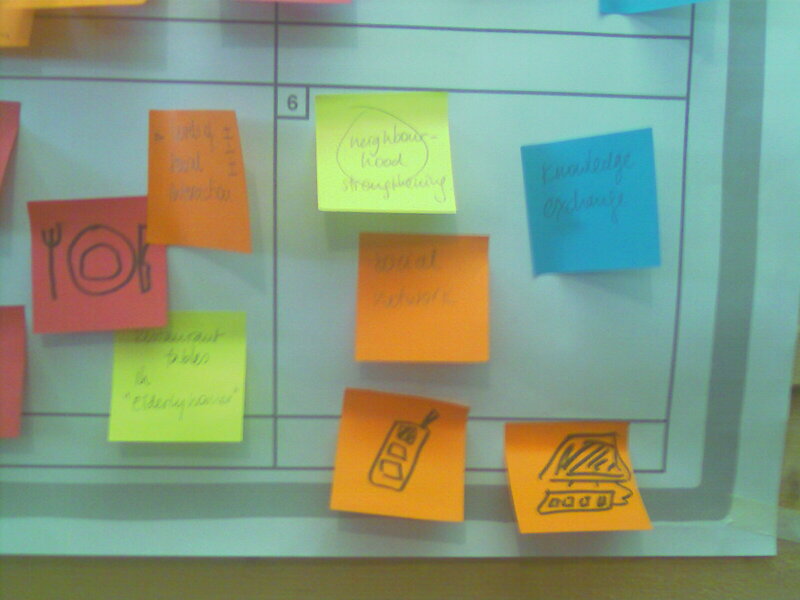 However there are many places where people THINK about service design, therefore experiment methodologies, add knowledge. It sounds like there is a huge potential to start a new kind of innovative activity, this potential is restricted by the lack of knowledge on service design on the companies and public administrations’ side, but the pressure for using this knowledge is becoming very high and sooner or later there will be an explosion of cases. The fact that there were so many companies, business associations (e.g. Confcommercio, the association of retailers in Italy) and government institutions (e.g. Erhverv og Byggestyrelse in Danmark) demonstrates that public perception of service design is increasing. The panel on Scandinavian design, which was quite boring, anyway (I think it should have been organized differently, because the speakers had much more to say), suggested me another consideration: while in UK the professional profile of service designers is very well defined, in the other countries such profile is totally unknown. This is probably preventing business and government to think of service design as a resource, or to frame service design correctly. I’m aware, for instance, that the Danish government considers service design as a branch of the traditional Danish design, therefore assuming that traditional product designers will be able to solve the systemic complexity and the organizational issues related to the design of services. A methodological consideration: I’ve seen many projects in this conference: all of them used the same methods and the same terminology. The metaphor of the “journey” was new to me – I always preferred to use “scenarios” instead- however I discovered that almost everyone is using it. The homogeneity of the methodology could be a good sign, it may mean that we are somehow consolidating a tradition of working in this area. However I have my own doubts about what I’ve seen. I had the impression that service designers are learning very well how to involve users and stimulate participation and coproduction. I think the exercise proposed by ThinkPublic was very significant in this sense. However I’m wondering whether the metaphor of the “journey” is good enough to describe the systemic perspective of service design. When we have a journey we usually use some tools (unless we walk to Santiago de Compostela). We may use a train or a car or we may fly. My impression is that the focus on the journey casts the spotlight on the experience (and in fact a lot of works were coming from the experience and interaction design area), but leave the backoffice in the dark. Furthermore when we travel we intersect our journey with the journey of many other people: other customers, but also people who are supporting our journey. What about the journey of the flight assistant? And what about the journey of the air traffic controller, which we never meet during the journey? I would like to see some works that mixes the two perspectives of front and back office. It is also a matter of changing the scale of observation: a journey corresponds to the 1:200 scale in Architecture, whereas we need a 1:1 scale for certain types of interaction. I tried to work on this scale with Use Cases, but I had no chance to discuss this scale, because there were no cases in the conference discussing this. In other words this conference was the reverse opposite of what you read on service design on management and engineering books: whose books (see Ramaswamy, Hollins, Pugh and others) emphasise the organizational and functional aspects of product service systems; they do not organize services from the users’ point of view, but rather from the perspective of an organization. What I’ve seen in this conference is a focus on users, whereas the organization, or the mechanism that support users’ experience in a service, was possibly forgotten. I should say, though, that this is what the conference showed and what it did not show, as in the normal activity of service designers I the functional and organisational issues of a service system are not ignored. Engine, for instance, presented an interesting case in the Kent city council, but only if you visit their website you discover that, beyond what they presented they also worked on a “service specification document“. Perhaps showing and discussing this to the conference would have improved my (and not only mine) overall impression about the presentations in this conference. Finally I had a fantastic idea from this workshop: I’m working on services and infrastructures for elderly people and I thought that there could be a lot of projects in this area. The one I’m most interested in is an exploration of Web 2.0 tools for ageing people. Is there anyone interested in working on this? I’ve seen many studies on service design which just distinguished a front office from the back office, this post instead is magnifing this thin line of the touchpoint and emphasising the various elements of the interaction. On the other hand the back stage here is just mentioned as such, without the articulation that I’ve seen (and used) in other cases. This is probably due to the design perspective proposed by some schools, which focus on service design as interaction, whereas I’m more confortable with a more systemic view of interaction design, which also includes the design of the system in the backoffice. In this perspective the design of a service (or a Product Service System, PSS) should be consist in designing new element in people everyday life and in business practice, on the basis of the interaction taking place in the service encounter/Touch point/moment of truth.